In order to offer an additional service to its customers, Électro-5 provides a service of residential and commercial electronical devices repair. .
To extend their lifetime. Whether you have a part or a fuse to replace, repairing your device allows preserving it for many years. When the device is not too damaged and the repairs to make are minor, it is often more interesting, economic and practical to repair devices rather than throwing them away to buy new ones. To protect the environment. Making the choice of repairing a device rather than getting rid of it is also a good way to avoid waste production and extraction of new raw material. In fact, new devices require the extraction of raw material which generates pollution. Besides, when your old device is not recycled properly,it can cause harm for the health and environment. Repairing devices is an eco-friendly option which contributes to reducing environmental footprint and to extend the lifetime of devices. These are the types of devices we repair and clean. A deposit is required in order to make an estimate on a device at the shop. The deposit is fully deductible on the repair. -	The customer doesn’t have is device fixed. -	The device is non-repairable or the parts are unavailable. In those cases, the deposit is never refunded. The amount of the deposit can change according to the type of device to fix, however the conditions stay the same. An extra deposit can be asked to cover the fees of essential parts required for the repair. This information will be communicated with the repair estimate. The warranty of the repair is 3 months after the device is handed back to the customer. If this period cannot be met, we will notify the customer on the estimate with the reason. Every device received for estimate and/or repair will be kept for a maximum period of a year from the redaction date of the estimate. After this deadline, the device will be disposed at the discretion of Electro-5 Inc. to cover the expenses incurred. The deposit is fully deductible on the repair. •	Every component required for the repair will be separately billed on the invoice. •	Additional fees on different material can be charged in accordance with the job to do (tin/cleaning product/glue/etc.). Are you concerned about the environment? We are too! In fact, Electro-5 is an official point of deposit for ARPE (Association of electronical products recycling) and Appel @ recycler (calling for recycling) . This is why we offer the service of collecting electronical devices and batteries for electronic to ensure that This is why we offer the service of collecting electronical devices and batteries for electronic to ensure that. We invite you to come and return your damaged or non-repairable devices and your batteries for electronic for free. 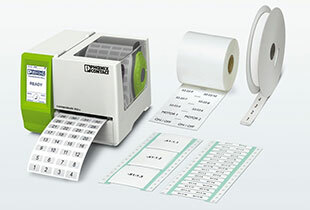 Electro-5 offers personalized marking services for the industrial and commercial market. In order to offer perfection to its valuable customers, the enterprise has developed an expertise in offering on-site services to meet specific needs. As a result: your orders will be perfectly completed in a short time! •	Personalizing your product with your details. Électro-5 proposes a personalized and sustainable marking service for all the needs in control panel. To meet the needs of our customers, several techniques are used. Electro-5 takes into account the conditions of the material (high temperature, outdoor material, etc.) to choose the appropriate type of marking. - Other several products available according to your needs. Discover our variety of printing products available, made on the same day. 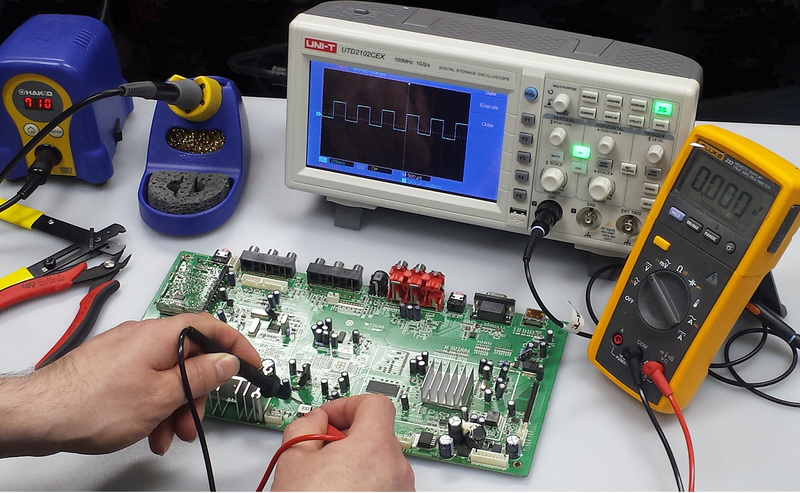 Electro-5 has been a leader for 30 years; we have all the products and expertise to meet your needs efficiently. Quality products as well as proactive and outstanding services, this is our commitment! Contact us for more information or a submission request. 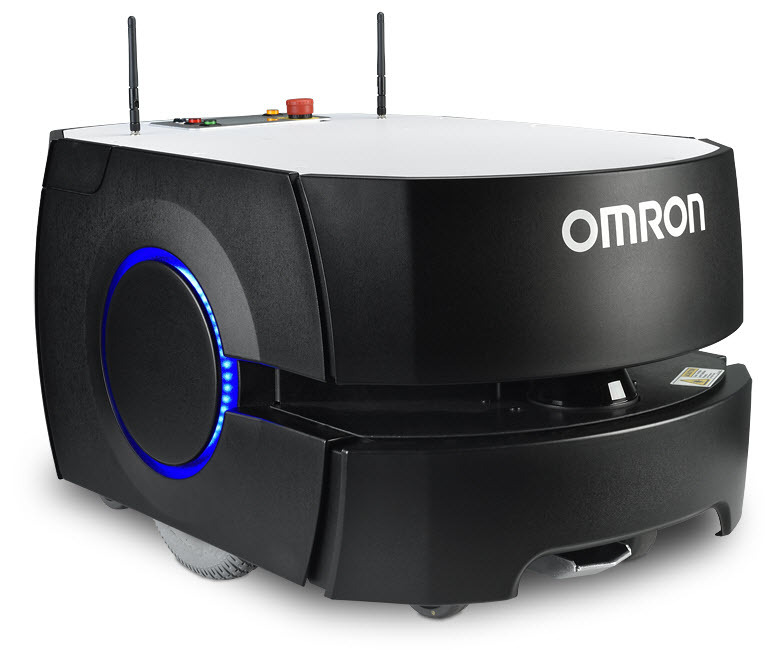 In order to better serve our customers, Electro-5 is now distributing the new Omron robotics range. 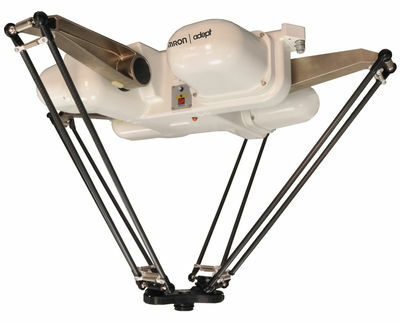 The Hornet 565 is a parallel robot for high-speed picking and packaging applications. The powerful controls are fully embedded into the base of the robot, saving valuable floor space and reducing installation costs and complexity. It features a hygienic design that minimizes contamination risks, including a standard IP65 rated work area and corrosion resistant materials for easy wash down. •	Hornet 565 requires no external control electronics, with all amplifiers and controls fully embedded into the robot. •	Extended vertical reach allows for a 0.36 m3 (12.7 ft3) workspace, enabling a wider variety of packages to be used. •	0.32 s cycle time enables higher product throughput and reduces cost per pick. •	Industry-leading conveyor tracking capabilities allow for < 5mm repeatability at all coveyor speeds (pending). 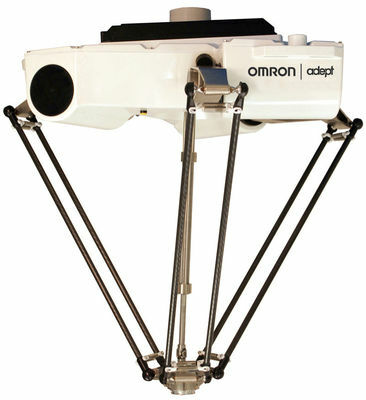 The Omron Adept Quattro robot is the only parallel robot in the world with patented features and USDA-accepted for meat and poultry processing. •	Robust components and design. •	High-efficiency, low-inertia drives and lightweight arms. •	8 kHz servo update rate yields high accuracy, superior slow-speed following, and easy calibration. •	Integrated temperature sensors monitor heat in servo motors to prevent damage. 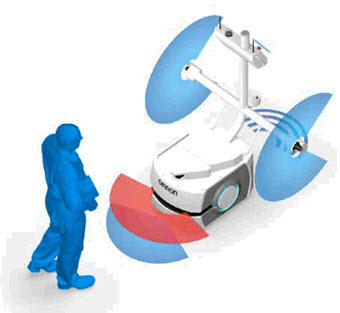 •	Diagnostic display on robot enables faster troubleshooting. 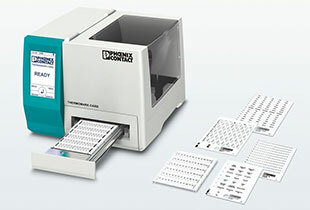 •	Quattro S650HS model is USDA accepted for primary food handling. The fastest picking system integrated in the Sysmac platform. 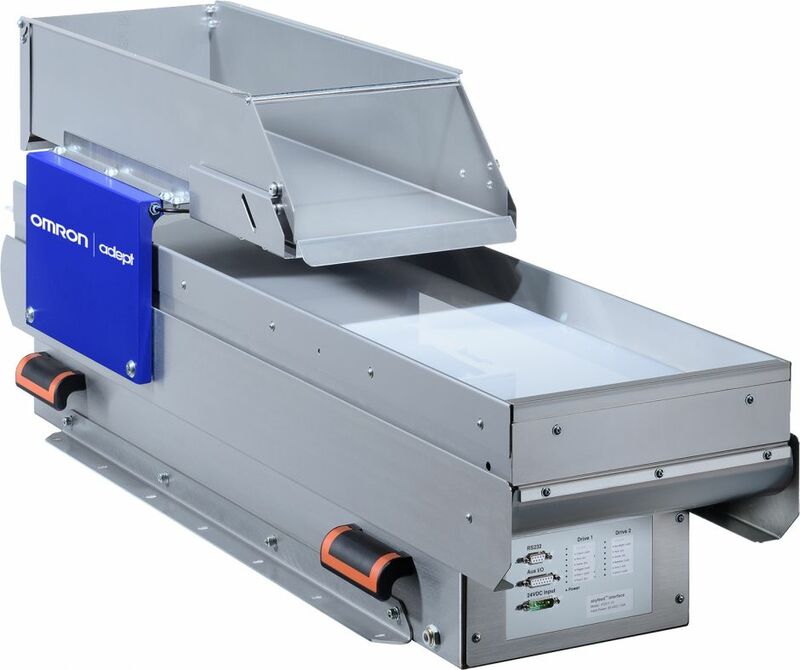 The Delta solution can achieve up to 200 cycles per minute and can be synchronised with multiple conveyors to perform on-the-fly Pick & Place operations. 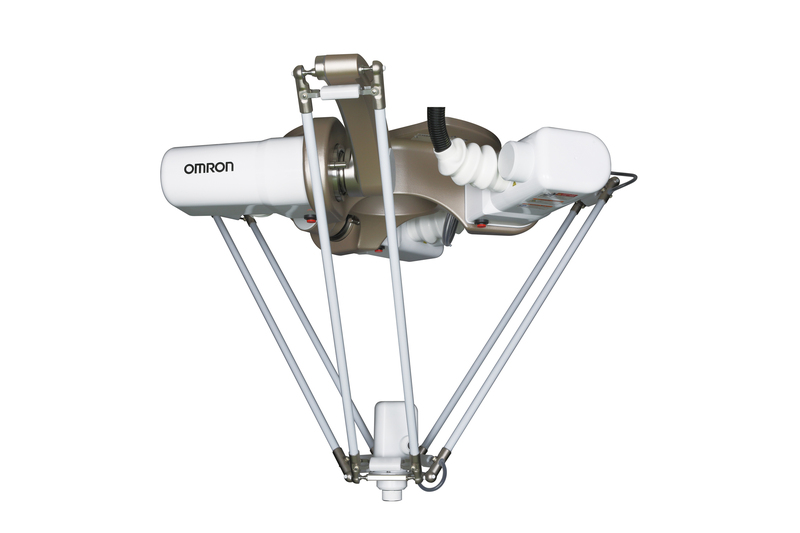 There are 3 types of Delta robot arms available as Washdown, Delta and Mini Delta robot. The NJ controller offers a response time of 2 ms when controlling 8 Delta robots or 1 ms when controlling 4 robots. •	Control of up to 8 robots by one controller. •	Degrees of freedom: 3 + 1 (rotational axis optional). •	Up to 200 cycle per minute. •	Model range from 450 to 1600 mm working range. •	Payload range: 1 to 8 kg. •	IP class range: IP65, IP67, IP69K. High-performance SCARA robot system for mechanical assembly, material handling, packaging, machine tending, screw driving, and other applications that require fast and precise automation. 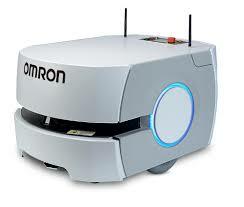 Omron Adept Cobra Series robots deliver performance unmatched in the industry with the included SmartController™ motion controller. •	ACE software deploys your applications through a user-friendly interface. •	High-resolution, absolute encoders give you high accuracy, superior slow-speed following, and easy calibration. •	High-efficiency, low-inertia Harmonic Drives and a lightweight arm deliver maximum acceleration. •	8 kHz servo update rate improves path following and control. •	Integrated 10/100 Base-T Ethernet TCP/IP to control the robot through a PC, PLC, or controller. •	Available options for cleanrooms and ESD to prevent static electricity during operation. eCobra SCARA Robot Series offers a compact system footprint, saving valuable floor space while minimizing installation costs and complexity. 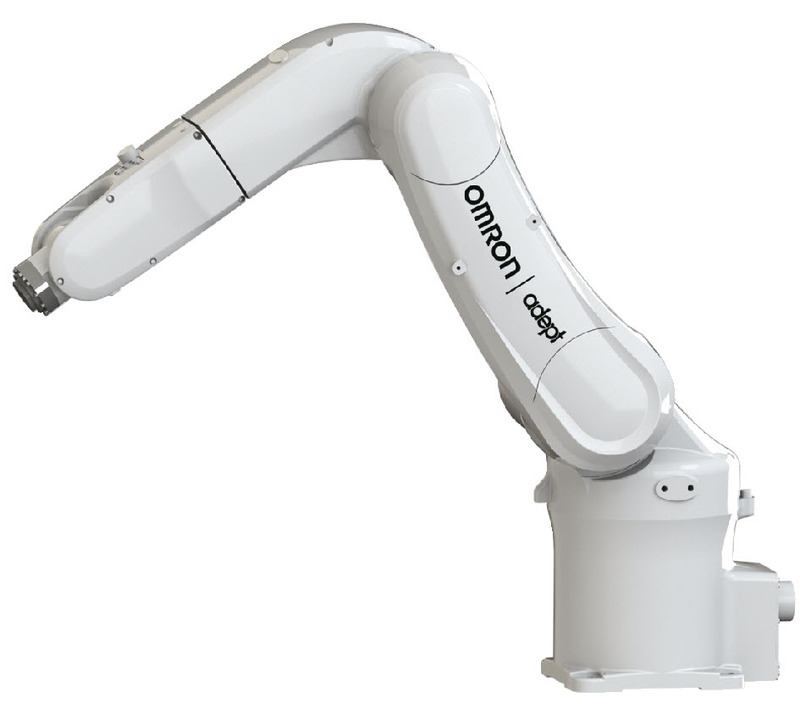 Omron's Adept eCobra 600/800 SCARA robot series features 600 or 800-mm reach and is available in three performance tiers, each designed to address different application complexity and throughput requirements. eCobra offers a compact footprint, saving valuable floor space while minimizing installation costs and complexity. This unique family ensures that users receive the highest quality, most durable robots at every performance level. •	Three performance levels (Lite, Standard, and Pro) based on a common hardware platform. Maximizes value by only paying for the performance required for the application, without sacrificing hardware quality. •	Upgrade performance with a software license download. Easily upgrade your robot to increase production throughput with a simple software upgrade. •	Advanced features such as direct PLC programming are included in Standard and Pro performance tiers- minimize training and deployment time using familiar ladder logic programming languages of existing PLC. •	Adept ACE™ provides an effective way to deploy applications, without lengthy, overly-complicated programming. •	Includes a powerful 3D emulator that allows complete system configuration and testing in a virtual environment. 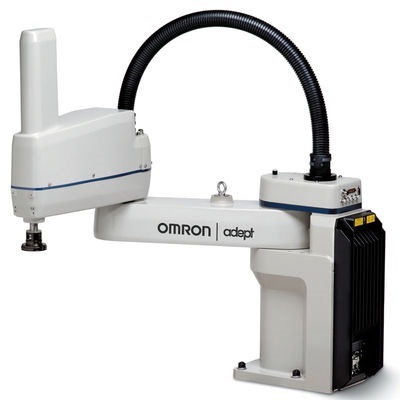 The Adept Viper™ six-axis robot is a high-performance articulated robot ideal for assembly, material handling, packaging, machine tending, and many other operations requiring speed and accuracy in a 650mm or 850mm reach. •	Rapid deployment using familiar ladder logic programming languages of existing PLC (IEC 61131-3). •	Diagnostics display enables faster trouble shooting. •	Ethernet TCP/IP capability to control the robot through a PC, PLC, or robot controller. •	High-resolution, absolute encoders to provide high accuracy, superior slow-speed following, and easy calibration. •	High-efficiency, low-inertia Harmonic Drives and a lightweight arm to deliver maximum acceleration. •	Maximum payload 5 kg. •	Self-navigation software safely avoids people and obstacles. •	Reliable drive system optimized for self-navigation. •	Structural support of payloads up to 130kg on level surfaces. •	Navigates through the use of a digital map. •	Easy to deploy, no facilities modifications required. •	Manages power and self charging operations. •	Runtime of up to 19 hours a day. •	Safety Rated Main Laser. 1 Safety std: ISO 12100, ISO 14121-2, ISO 13849-1, IEC61010(battery only), IEC 60950(battery only), EN 1525, ANSI B56.5 Part 3, JIS D6802, IEC 60204. Acuity provides an additional method of "localization" to the onboard laser, to allow the robot to operate in frequently changing environments. 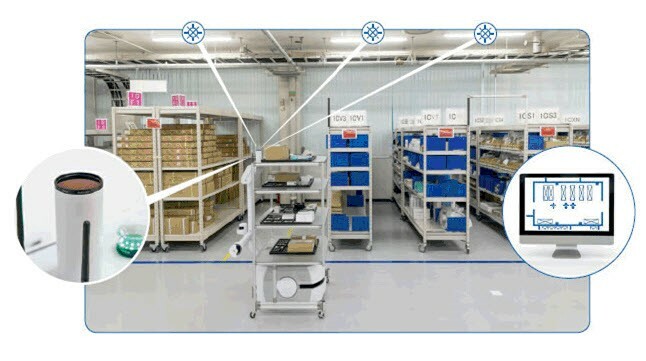 It identifies overhead lights and overlays the "light map" with the "floor map" It also allows the robots to move easily across wide-open areas in large warehouses. •	Protection for field strengths above approximately 40 kV/cm of air. •	Skins designed to resist the static build up. •	100% compatible with existing standard LD robots, optional skin sets are also available. •	Protection for both the robot and Electrostatic Sensitive Discharge Sensitive (ESDS) items. 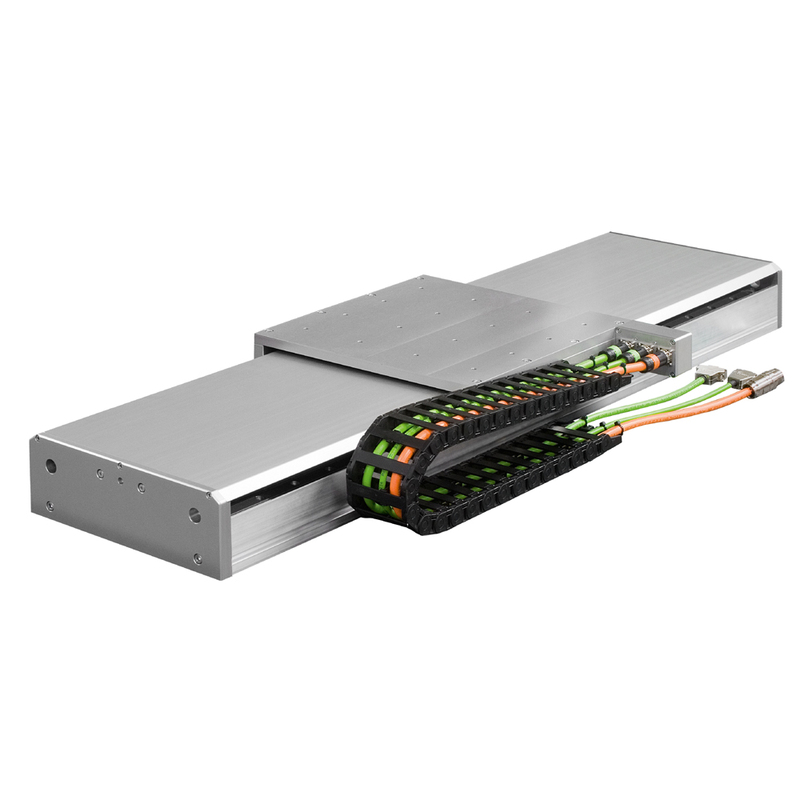 High-efficiency Iron-core linear motors and magnet tracks in a wide range of over 100 standard linear motor axes. •	Optimized stroke/product length ratio. 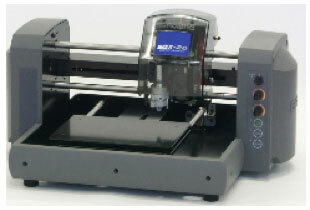 •	Up to 5 m/s maximum speed with 1 um repeatability. •	Compact and efficient design. •	Available preconfigured Gantry & Cartesian designs. •	Highly versatile and ready-to-use. 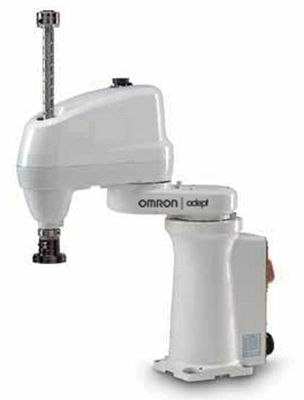 Designed to work with a variety of robots and in combination with Omron Vision software and controller, the AnyFeeder Solution provides an efficient and fast feeding solution. Its flexibility in feeding small parts of various size, shape and material allow for fast line changeover and significantly reduced tooling costs, to give you a crucial competitive advantage. •	Provide a complete solution with integrated components and software. •	Feeds a multitude of products. •	Eliminates multiple feeder systems on your line. •	Perfect for lines requiring rapid and frequent changeovers. •	Integrated vision refinement on the fly allows for vision verification of parts, increasing placement accuracy to within 17 microns. •	Automatically flips and shakes parts to separate and position for fast pick up. •	Dual configuration further increases productivity. •	Feeds various material types including plastic, rubber, metal, glass, and others.